The skin of your baby is extremely soft and smooth. The soles of the feet and toes are shown in this image and it is clear they are free from wrinkles. During the next week evidence of fingerprint and toeprint patterns will appear on the skin. Although changes are taking place, your baby’s lungs are still fairly immature and won’t be fully developed until week 35. Your baby’s complex lung development is continuing.To picture their growth and development, imagine the whole of the lungs as a tree: the trunk has developed (the trachea or windpipe), and this has branched into smaller and medium-sized branches (bronchi), but the twigs (bronchioles) holding the leaves (alveoli) have not yet formed. It is the alveoli that have walls so thin that they allow oxygen to be absorbed from the air in them and carbon dioxide to leave via the bloodstream. 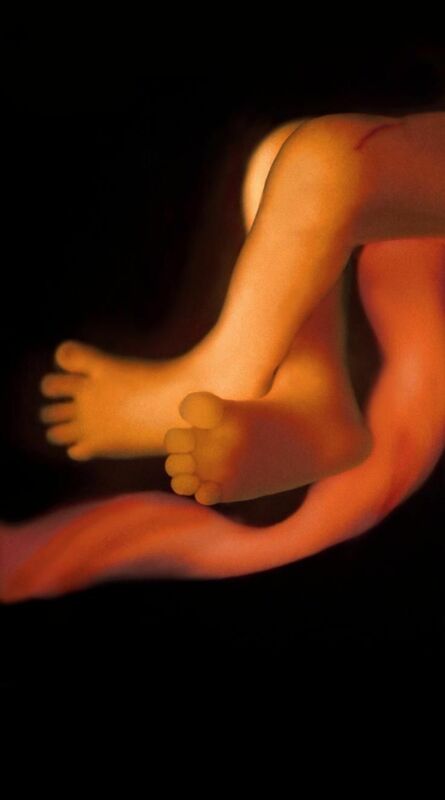 From now until 28 weeks the “twigs” are forming that will hold the alveoli that will become filled with air after birth. These “twigs” will have a limited ability to transfer gases but the lungs will not be fully effective until the alveoli develop. The growth of the blood vessels that support the lungs closely matches the growth of the lungs themselves. These blood vessels will be essential for the transfer of oxygen after your baby is born. After birth, all the blood that is leaving the right side of the heart will enter the lung circulation, but before birth, with the lungs filled with fluid and not used for breathing, only a small amount of blood (approximately 10–15 per cent) is directed to them. Relaxin is one of the most important pregnancy-related hormones.As its name implies, relaxin relaxes the connective tissue, tendons, and ligaments in your body to allow the diaphragm to expand and create space for your baby to grow. It also loosens the ligaments and tendons enough to facilitate the opening of the birth canal for a vaginal delivery. Relaxin affects most parts of your body and, as a result, your spine and pelvis will also feel less stable, so be aware of your posture and alignment when exercising. When standing, always keep your hips in a neutral position. Don’t move your hips to one side. Beware of hyper-extending (arching) your lower back and rounding your shoulders. Keep all your movements slow and controlled, and do not stretch beyond your comfort zone. The increased flexibility of your muscles and tendons could potentially result in over-stretching during activities such as yoga or Pilates. Relaxin is also responsible for the relaxation of the circulatory system: the walls of the veins are relaxed, which sometimes results in varicose veins. Doing cardiovascular exercise will help to increase blood flow and can reduce the occurrence of varicose veins. Consideration of health and fitness measures s very important for us that protect from various kinds of troubles. Writers of essay works offer to them on https://www.rushmyessays.org/ here from people get them on reasonable prices. Hi am nw 10 the week pregnant so I wish to know wa.. I am 14 weeks pregnant and my cervix length is not..